Really. Let's take an imaginary trip to Nepal. There's Mt. Everest over there. Lets mentally pick it up and fly it halfway around the world to Hawaii. Now put it down so its base is next to that large mountain, Mauna Kea. Step back and look. Surprise! 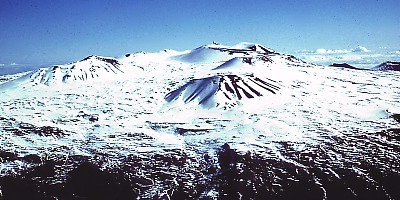 Mauna Kea is over 4,000 feet higher than Everest. But you've always heard that Everest is the "King of the Mountains." So what's the deal? Here's the confusion. As you noticed when you were putting Everest down, the base of Mauna Kea is almost 4 miles under the Pacific Ocean's surface ... 19,678 feet below, to be precise. Here's the payoff: if you add that submerged portion of Mauna Kea to the 13, 796 feet that towers above the waves Mauna Kea rises a total of 33,474 compared to Everest's 29,028 feet. So, give Everest its due for having the peak which reaches highest above sea level, but give Mauna Kea its due for being the tallest mountain from base to summit. Both ways of measuring mountains are legitimate. But, excuse me, if I'm 6 ft tall and standing knee-high in water I don't want people to say I'm only 4 ft tall. Let's extend Mauna Kea the same courtesy. A 5,000 mile wide storm is raging!